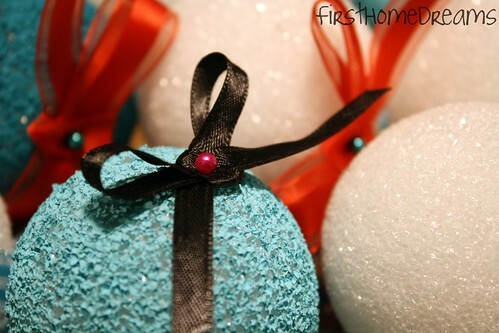 First Home Dreams: It's December! Winter Window Dressing. It's December! 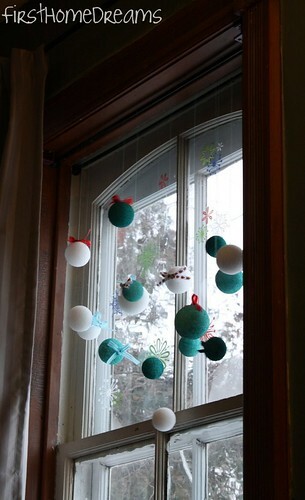 Winter Window Dressing. If you're new to the blog, you might not be aware of how much I love my windows. They might look like junk right now, but I love the light they bring into the house, and I know that with a little bit of work they can look fabulous again. With that in mind, I knew I wanted to give one of the windows in the living room a bit of a face lift for the holiday season. I hate this vase. No matter what I put in it, it's just not a shape that I like looking at. So out came the balls, and the vase went into the basket that's destined for Goodwill donation. 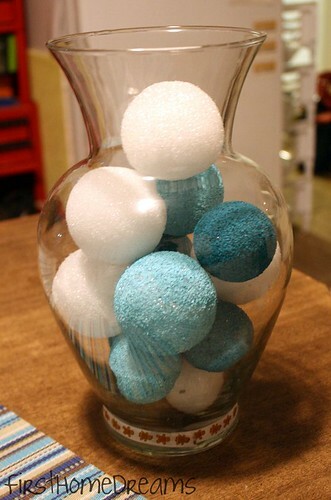 The painted styro foam balls got a makeover, in the form of a little bit of ribbon held in place with a straight pin. I bought a sheet of 97 cent window clings from Walmart to fill in the gaps and make it a little more cohesive than random floating balls. I used two tension rods (around $9 a piece, which I bought for a future, after Christmas, project) to hang the balls in the window frame. I used varying lengths of thread to get some definition, which was attached to the styro foam balls using fabric glue. The other Christmas decorations that I plan on putting out have been brought up from the basement, and Tahsis seems to find the whole thing perplexing. Also, yes, Lumpy the Ottoman still lives. 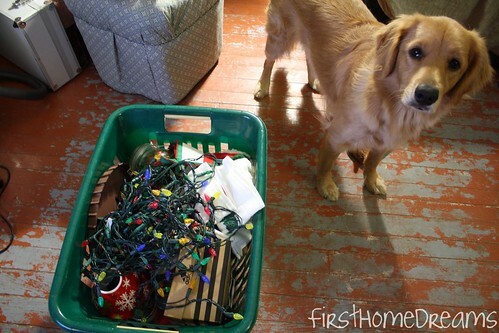 Is anyone else decorating this weekend?